Star Tours Tomorrowland attraction at Disneyland, created in cooperation with George Lucas; opened on January 9, 1987. Opened at Disney-MGM Studios on December 15, 1989, and on July 12, 1989, in Tomorrowland at Tokyo Disneyland. Also in Discoveryland in Disneyland Paris; opened on April 12, 1992. 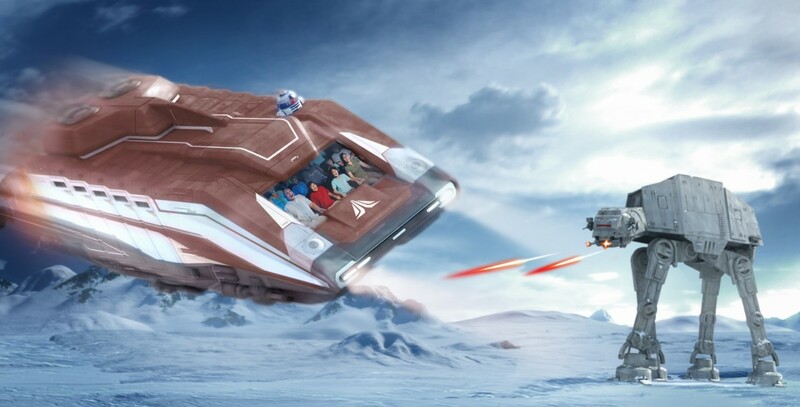 Guests traveled in vehicles called StarSpeeders, each holding 40 passengers, to the Moon of Endor and beyond. In the pre-show area, one can watch R2-D2 and C-3PO from the Star Wars films working to service the fleet of StarSpeeders. The voice of the trainee pilot, REX, was provided by Paul Reubens. The attraction was completely revised in 2011, with multiple random storylines and locations, in 3D. A new scene inspired by Star Wars: The Force Awakens is scheduled to be added to the Disneyland attraction on Nov. 16, 2015.